This quirky novelty along South Carolina Highway 174 stands proud as a testament to the offbeat spirit of Edisto Island. 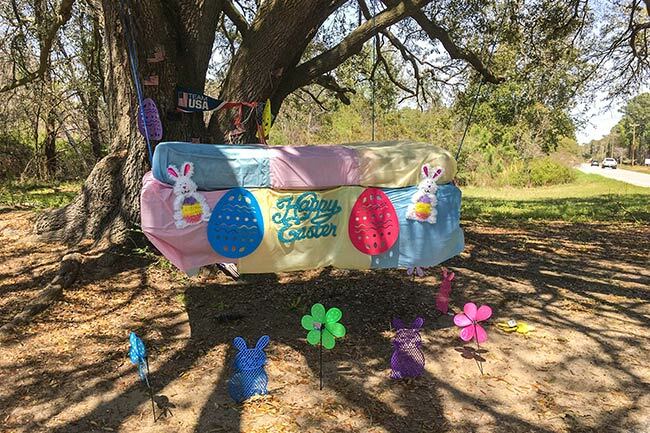 The Edisto Island Mattress Tree is one of two celebrated local landmarks that locals and visitors alike have come to love about the island, the other is the famous Edisto Island Mystery Tree. 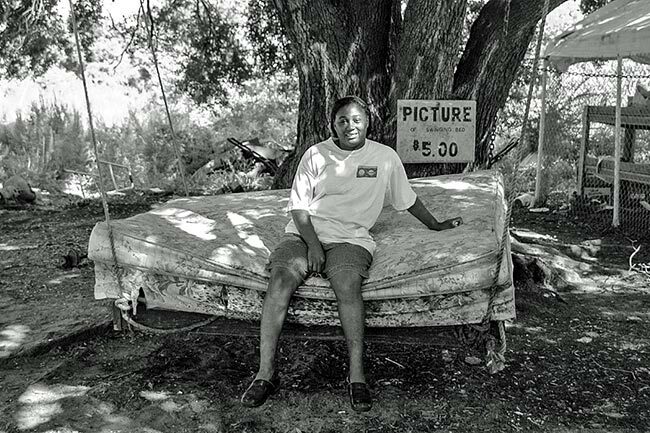 Over the years the mattress tree has become a roadside oddity where visitors can stop to photograph one of the true pieces of what makes South Carolina undeniably wonderful. 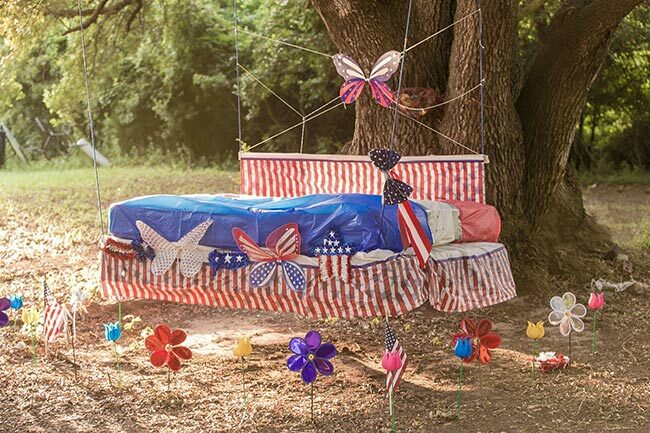 Known to some locals as Mattress Point, this mattress swing was the idea of Edisto Island native, Frank “Tish” Gadsden, whose mother was a direct descendant of slaves on the island. 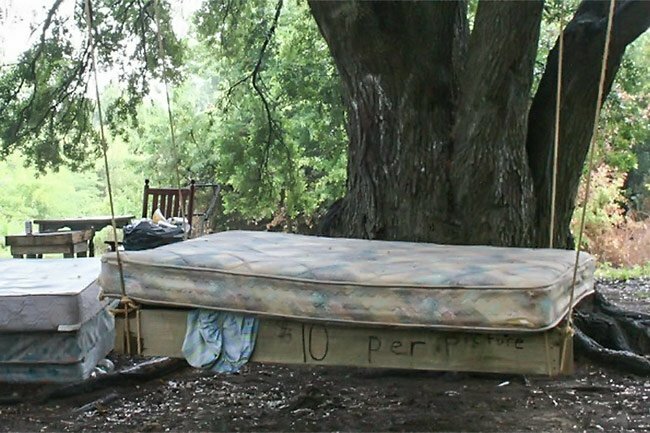 It is said that the mattress tree began as a bit of a “dog house” for Tish when he partook in libations and his wife would get angry. He is noted as saying he had a cot on the ground and he looked above to the gnarling branches of this ancient oak and thought to himself to hang his bedding in a tree like a hammock. What began to locals in the 1970s as a curiosity or eyesore became a beloved landmark where friends would come to visit, play cards and lovingly tell tall tales. Tish once had a fruit stand here but his business would later become charging people a nominal fee to take a picture of his landmark that was sure to become a legend. Every summer a new mattress was put out on the tree and each winter it was taken down. This painting was completed by the talented artist Becky Lee of Walterboro. Becky was largely self taught and mused “I never could color between the lines.” My earliest memories of being an artist began as a child, as soon as I could hold pencil and crayon.“ My mother complained that she could never keep me in notebook paper because I drew on everything.” After some helpful guidance from a primary school art school teacher and later, a thoughtful husband and art coach, she has developed her own style that depicts the Lowcountry in a fresh and energetic way. You produce such beautiful work, thank you so much for allowing us to use it here! 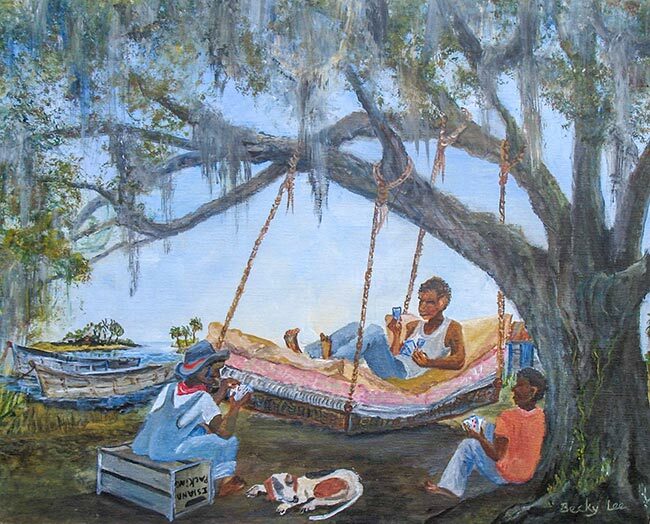 My title for this painting of the mattress tree was “Edisto Beautyrest.” I am so happy to have it on this website. I “love” my work when I am producing it and then I love it again when others love it too. Please visit my website to see more http://www.Beckysart.com. Just got back from Edisto Beach, this place and the tree. Truly love it! I would like to have a print or card with this on it. If anyone knows where I can get one pls let me know. I did find a picture in a gallery there, but couldn’t afford it!